I often find recordings of the “lo-fi” esthetic very frustrating. Bad quality sound in a live situation is something that often can’t be avoided, and is mitigated by the positives of having the performers right there making the music. But when you take the time to record for later listening, distortion and poor equalization can be very tiring and distract from the content and quality of the music. In the case of vintage live recordings, I’m willing to make some allowances if the performance is of historical significance. This recording by the now-international group Ni-Hao! is quite a mixed bag in a lot of ways, not least the fidelity of the recording. Some tracks have an overdriven distortion that could have been recorded on a smartphone in a dive bar, and one track is explicitly called out as a live recording. Others have cleaner sound, akin to good quality modern demos. But the band’s style, which they call “cheer punk,” might be described in outside-world terms as “art-punk,” and lends itself to quick-and-dirty recording. They’re all about spontaneous fun, and precision playing is not at all required. 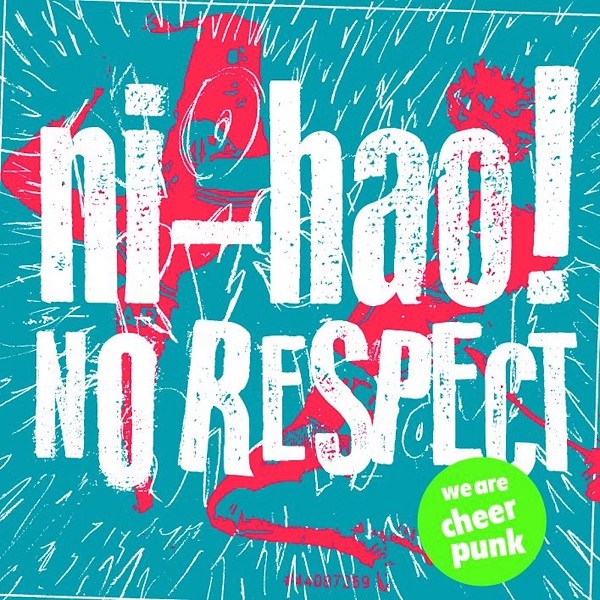 That being said, there are some very inventive sounds on No Respect, with thrashing guitars and shouted vocals one moment and rinky-dink drum machine with piano bass the next. Or wildly oscillating synthesizer, or chopped up sampled spoken words. The inconsistency becomes the theme, and the album becomes a sonic collage, a cut-and-paste vision of the weird musical world these women inhabit.